I love finding new great cookbooks, especially Vegetarian ones. I went partial Vegetarian about 3 years ago mostly because I felt so much better when meat (ie. chicken, beef and pork) wasn't a part of my diet. I still eat fish and most kinds of seafood, so in technical terms I would be considered a pescatarian, most people ask if I ever crave meat, but in all honesty I don't..... proper planning and preparation helps me get everything (ie. vitamins, nutrients, protien, etc.) I need from a plant-based diet and it is now the best fit for myself and my families lifestyle. 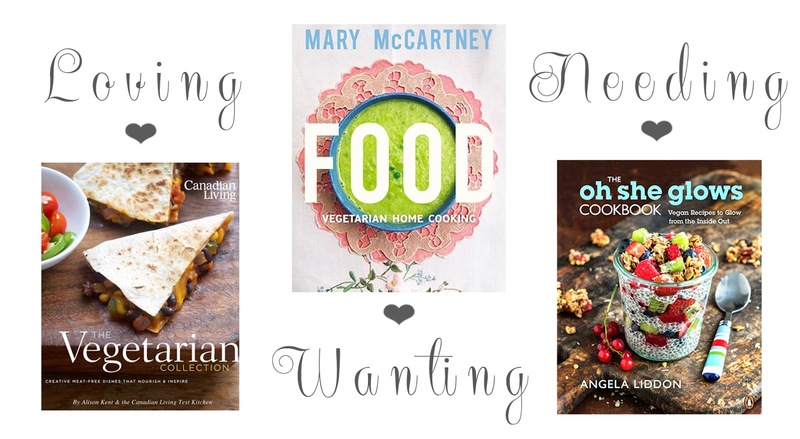 Here are a few cookbooks that I am currently Loving, Wanting and Needing in the vegetarian cooking department! The Canadian Living Vegetarian Cookbook is my go-to cookbook, there are so many great recipes in this book, my favourites are Tofu & Broccoli in Peanut Sauce and the Vegetable Lentil Garner's Pie when I have some extra time to prepare a casserole. All the recipes in this book are fairly simple with simple (find in your cupboard) ingredients. I love love love this cookbook! I saw Mary McCartney's book in Homesense a few weeks back and have been kicking myself for not buying it....it was only a few days later that I read Amanda over at Natural Mommie's post and seriously considered running back up to the store to see if they still had it stocked.... I suppose I could just order it online too... but who doesn't like a good Homesense find!! 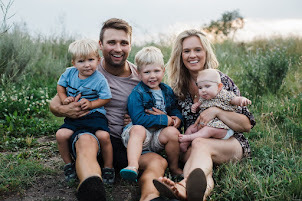 I keep hearing great things about the Oh She Glows cookbook, and I need to get a copy for myself.... Angela Liddon has been blogging healthy meat-free recipes for years now and her book has been getting a lot of press. I follow her blog and find myself drooling over posts on a regular basis...(check out one of her most recent posts.... Instant Chocolate Chia Pudding...... mmmmmm). Do you have any veg or regular cookbooks you would recommend... I am always keeping my eyes pealed for new ones! Don't forget, if you haven't already entered this weeks GIVEAWAY with Hattrick Design, you still can! Don't miss out! Thanks for sharing, Carling! I've only made a couple meals from "Food" but so far I'm loving it. Her lemon cake was amazing :) I picked up Oh She Glows at Costco a few weeks back for a steal, too!